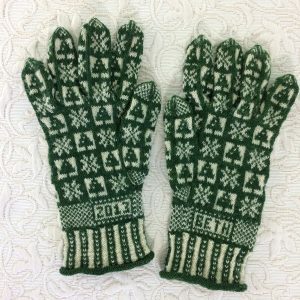 Over the last century, the Coast Salish people of Vancouver Island in Canada have been producing the Cowichan Sweater, a unique garment of bold motifs and interesting construction techniques. 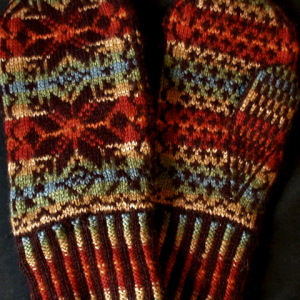 These mittens and hats incorporate motifs used in some of the traditional pullovers and cardigans. This Cowichan-inspired kit includes the pattern for matching hat and mittens, knitted circularly, and three colors of yarn for the Small Child size. (See separate kit for Large Child, Medium to Large Adult, Extra-Large Adult.) 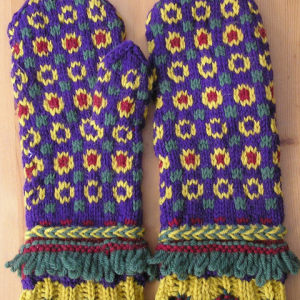 The pattern has Theory Boxes on how to weave the stranded yarns English style and how to avoid the purl bump when changing colors in ribbing. The pattern also includes charts, a List of Abbreviations, and a Bibliography. Yarn: I have chosen Brown Sheep Company’s Lamb’s Pride Bulky for these designs, as this yarn is a single-ply like the original yarns. 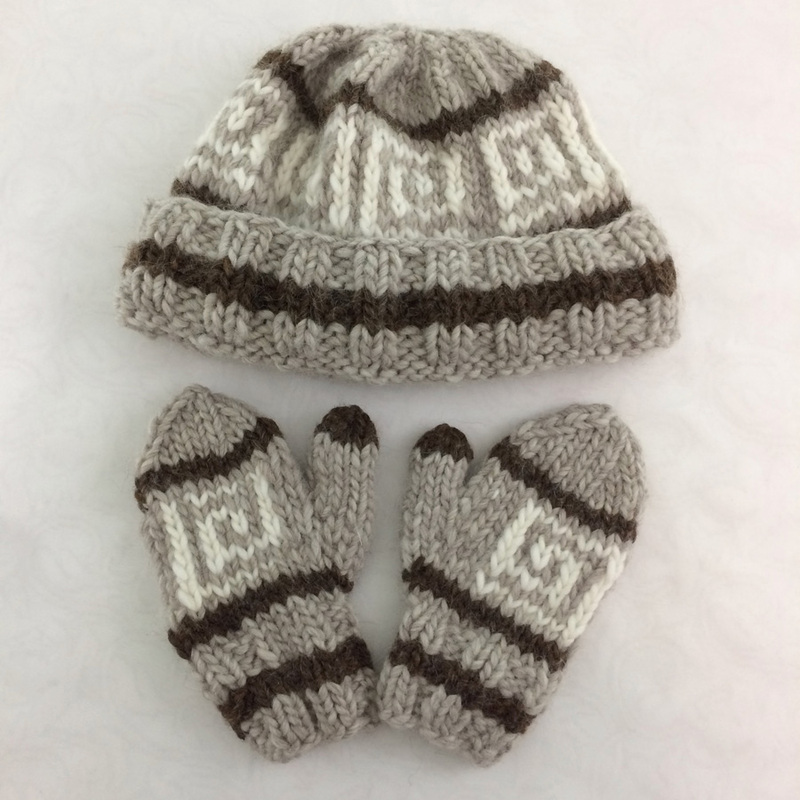 The yarn used is a blend of 15% mohair and 85% wool and approximates the weight used for the traditional Cowichan sweaters (albeit a bit thinner than the traditional). 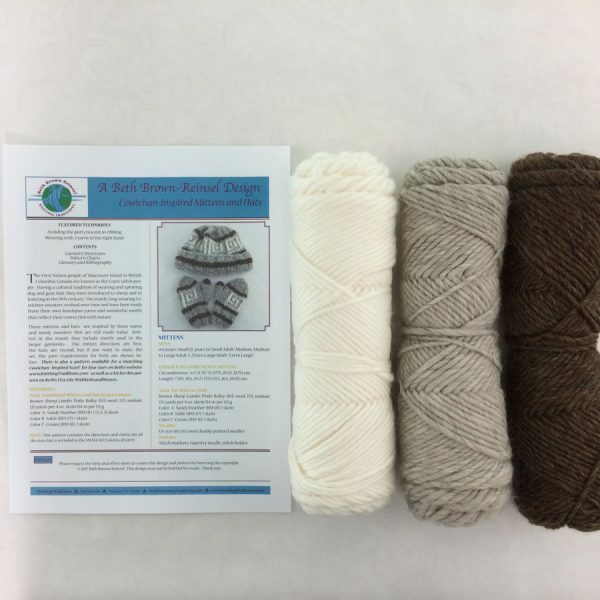 The colors are in the brown range, Sandy Heather, Sable, and Cream. 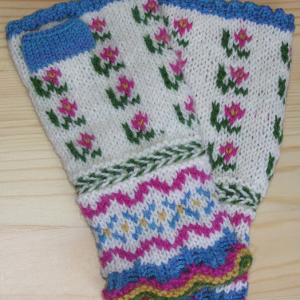 Needles: All you need is a set of US size 10.5 double pointed needles and a 16″ circular needle. Notions: Stitch markers, a stitch holder, and a tapestry needle.